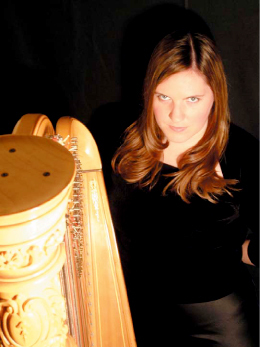 Natalie Ruotsinoja Durk is a professional harpist currently residing in St. Paul, MN. She received her bachelor’s degree from the University of Michigan School of Music. In addition to playing with a variety of chamber groups, Ms. Durk has also performed with the Boston Civic Symphony Orchestra, the Ann Arbor Symphony, and the Moody Blues. In 1999, she was recognized as a finalist in the Advanced Division of the American Harp Society National Competition. Ms. Durk also has a teaching studio and is a writer/contributor for the Harp Column magazine. Feel free to contact me if you would like more information or if you are interested in harp music for your special event.